SysTools » Blog » News » Do You Know Microsoft Announces End of Support for Windows 7 In 2020: Dig In Here! Do You Know Microsoft Announces End of Support for Windows 7 In 2020: Dig In Here! Across the globe, billions of people rely on the Windows Operating system. Windows OS was introduced by Microsoft on November 20, 1985. It is the most versatile and feature-rich Operating system available in different versions. In January 2015, Microsoft ended the mainstream support for Windows 7. Now, the software giant has decided to put a final halt on the roll-out of free security patches also for Operating system next year. ‘After January 14, 2020, Microsoft will no longer provide security updates or support for PCs running on Windows 7’. When Microsoft will end support for the older OS, users will still be able to operate on it but the users will not receive any software, feature or security updates. However, Windows 7 will still be available for installation and activation after January 14, 2020. Microsoft recommends that one must upgrade to Windows 10 to avoid security risks and virus. Right Now You Must Be Thinking: Why Microsoft Stops Support for Windows 7? Latest operating systems introduced by Microsoft are Windows 8 and Windows 10. So, Microsoft needs to sell its latest operating systems. To do that effectively, they must have to stop support for the older operating system. However, it is bad news for all Windows Operating system users who still work on Windows 7. Ultimately, to deal with this situation, one has to upgrade to Windows 10. 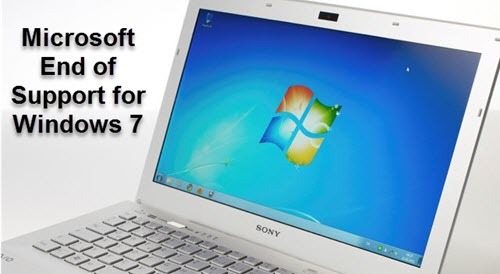 Many questions will arise in the Windows 7 users mind thus, in the below-mentioned section we are going to discuss some frequently asked question on why Microsoft announces end of support for Windows 7. If You Are A Windows 7 User Then This Might Help You Out! What will happen If I continue to work with Windows 7? Answer: One can continue to use Windows 7, but once the support ends, the user’s PC will become more vulnerable to security risks. So, you can continue to work with Windows 7 but it can affect your system and data present in it. From several years, I use Windows 7 for my business as well as personal work. After, reading this blog, I want to know that Can I upgrade my existing PC to Windows 10. Will it be beneficial for my organization? Answer: Yes, you can easily upgrade to Windows 10 and it will be beneficial for your organization as Windows 10 is integrated with amazing hardware capabilities, great graphical user-interface, extraordinary features etc. After January 14, 2020, can Windows 7 still be activated? Answer: Yes, after the end of the support for Windows 7 it can still be installed and activated. To eliminate security risks and virus, it is advised to upgrade to Windows 10. Answer: The support for Internet Explorer on Windows 7 devices will be discontinued on January 14, 2020. For Windows 7 users it is not at all good news. Windows 7 was released in October 2009 and in 2020 Microsoft is going to end all support for it. However, it is recommended to upgrade to latest Operating system that is Windows 10. One can still use Windows 7 but it will be risky from the security point of view. Changes are essential for everyone to survive in the speedy world. Most of the people are not comfortable with change but some changes are always better to accept. Similarly, Microsoft ending support for Windows 7 in 2020 for the betterment of all the users. As it is known by everyone that, Microsoft is one of the most reliable brands so if they have taken the decision to discontinue support for Windows 7 then it will surely benefit all the users out there.